Despite a promising opening 30 minutes at Tolka Park last Friday evening, Athlone suffered a 3-0 defeat to mid-table outfit Shelbourne. Last weekend’s 4-0 thrashing of Cabinteely meant Athlone went into this game full of confidence. Shels on the other hand had managed just a single point from their previous five games. The Town were without some key players for this tie, with Joe Moloney sitting out the second of his two-match suspension, and Jason Lyons, Ronan Hanaphy, Craig Shortt, and Tom O’Halloran also unavailable. Dylan Owens made his debut between the posts in place of Jamie Quinn. The opening minutes of the game were incredibly scrappy as both sides struggled to maintain possession. The first chance fell to Shelbourne from a set piece. A dangerous in-swinging corner was met by the head of Shelbourne captain Daire Doyle, but his effort flashed just wide of Dylan Owens’ goal. Athlone were next to go close, when Ryan Gaffey slid a pass through to Conor Barry who sent a shot just wide of the Shelbourne goal. Gaffey and Barry were causing havoc among the Shelbourne defence in these early stages, but Athlone were dealt a major blow when Barry suffered a knee injury and had to be replaced, Aidan Byrne coming on in his place. Barry’s absence told as Shelbourne struck just a few minutes later. Having looked dangerous from set pieces, Shels took the lead on 33 minutes through a looping Carl Walshe header. Shelbourne’s second goal came on 39 minutes and resulted from a series of errors. 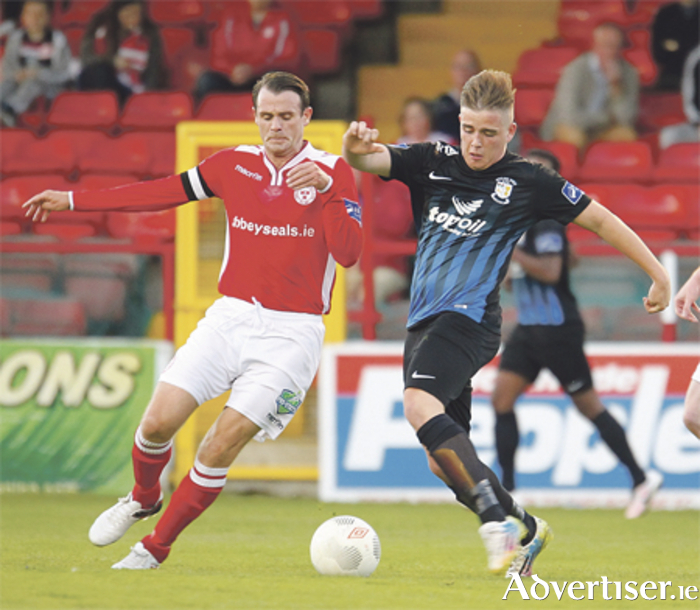 A long innocuous ball out of Shelbourne’s defence caused panic in the Athlone back line. Jack Quinn allowed the ball to bounce and then subsequently lost his footing to allow Walshe through on goal. The Shelbourne man made no mistake, producing a neat finish past the onrushing Owens. Shelbourne went in at the half-time interval with a deserved two-goal cushion. The second half continued in the same vein with Shelbourne on top and comfortably controlling possession. Cian Kavanagh and Daire Doyle were particularly impressive in the centre of the park. The result was sealed on the hour mark when a through ball by Kavanagh was seized upon by Lorcan Shannon who burst into the penalty area and was taken down by a clumsy sliding challenge. Jamie Doyle slotted home the penalty to make it 3-0. Shelbourne saw out the remainder of the game without allowing Athlone any real chances. Despite the result, Athlone remain second from bottom due to Cabinteely’s loss to UCD. However, Colin Fortune will be disappointed by aspects of his side’s performance, with sloppy defending putting any chance of getting a result in this one out of reach. Athlone face an efficient Drogheda United outfit at Lissywollen on Friday. Drogheda have won three and drawn five of their past five matches as they remain in the hunt for a promotion play/off berth. One of Drogheda’s issues, though, has been the fact that they have only registered four wins away from home in the league. They will be aiming to become more clinical on the road and so Athlone will be fully aware of the threat the Boynesiders carry. In 23 matches a youthful Athlone side have only posted three victories, twice defeating Cabinteely and Shelbourne at Lissywollen. Fortune has put a significant emphasis on giving youth its fling during the past month, so the remaining five matches of the campaign will be useful ahead of the daunting challenges that await next year.